HALLANDALE BEACH, Fla. (October 17, 2018) – Fraudlogix, an ad verification company, has released a new report that finds 14 percent of North American digital ad traffic to be fraudulent - the highest percentage among four major global regions. 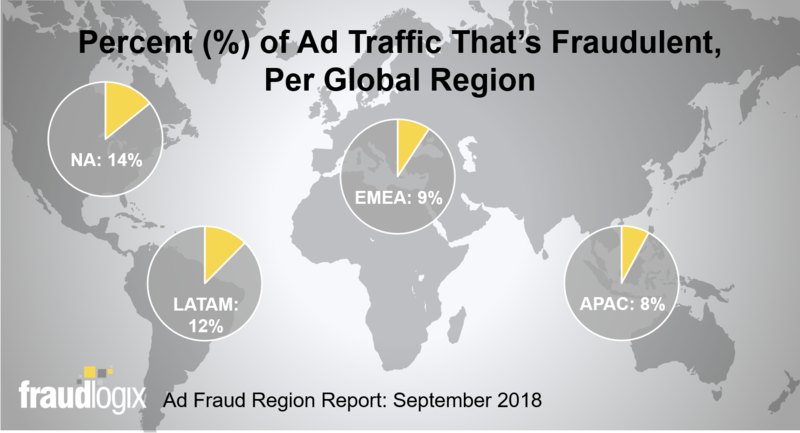 Eight percent of Asia Pacific (APAC), nine percent of Europe/Middle East/Africa (EMEA) and 12 percent of Latin America (LATAM) digital ad traffic was determined to be fraudulent. The report also broke down ad traffic by the devices ads were delivered to and found that the APAC region had the highest percent of ad traffic coming from mobile devices (68 percent), LATAM region had the highest percentage of traffic coming from desktop devices (46 percent) and North America had the highest percentage of ad traffic coming from tablet devices (six percent). The LATAM region had the highest percentage of fraudulent ad traffic from mobile devices at 12 percent, and the North American region had the highest percentage of fraudulent ad traffic from desktop devices at 24 percent. In 2018, programmatic ad spend is projected to reach $39.1 billion In the United States alone, according to eMarker. This makes North America a prime target for digital ad fraud. Global ad revenue lost to fraud is estimated by Juniper Research to be $14.2 billion in 2017 and $44 billion by 2022. The report defines fraudulent ad traffic as ad impressions that were generated by bots, compromised devices, and other nefarious means. It includes the percentages of fraud found in real-time bidding (RTB) advertising traffic during the month of September 2018. Fraudlogix’s pixel-based technology regularly monitors data from 640+ million unique users, 1.2 billion unique devices, and 12 million URLs monthly. Fraudlogix maps the latest devices, locations, bots, behaviors, and hacking tactics that are being used by digital fraudsters. Fraudlogix is an online advertising fraud detection company founded in 2010 by industry veterans with a deep understanding of the digital ad ecosystem. It specializes in ad fraud solutions for desktop, mobile, in-app and video environments for the programmatic and affiliate spaces. Today, Fraudlogix monitors data from over 640 million unique users, millions of websites and 1.2 billion unique devices monthly. Visit www.fraudlogix.com for more information.